Akragas was the Greek name of Agrigento and it comes from the name of the river next to which Gela founded a trading post which gave birth to the new town the year 581 B.C. Gela is about 80 km to the South East of Agrigento and it has ancient Rhodian and Cretan origins. The first tyrant of the new town was Phalaris who managed to conquer a large land and allowed the town to become very powerful and wealthy. One century later, Akragas and Syracuse wan the battle of Himera against the Carthaginians and that victory marked the beginning of the golden century of the Greeks of Sicily who gained the control of the trading in the Mediterranean sea. Since then they started to build most of the temples which can be seen even today. Empedokles, a genius from Akragas, wrote: “the inhabitants eat as if they are going to dye tomorrow and build as if they are never going to dye”. Pindar, one of the most famous Greek poets wrote: “ Akragas is the most beautiful city human beings have ever built”. Unfortunately in 407 B.C. the town was raised down to the ground by the Carthaginians. Later it was reconstructed but it never reached again the power and the beauty of that time any more. The Romans conquered the town in 210 B.C. during the Punic Wars and called it Agrigentum. During imperial time they built a big temple dedicated to Isis and the economy of the town was based mainly on the extraction of sulphur and on agriculture. The wealth of that time is shown by beautiful houses decorated with mosaic floors and frescoed walls which can be seen in the Hellenistic and Roman Quarter. In the 4th century Sicily was invaded by the Vandals and the Goths and the ancient city walls of Akragas were destroyed. 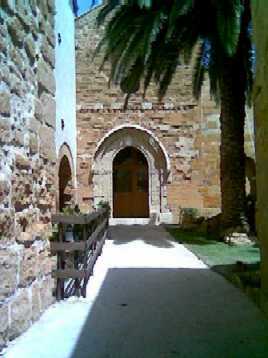 In the 6th century the Byzantines converted the so called temple of Concord into church and that has contributed to the conservation of that temple. During the Arab time, from the 9th to the 11th century the town was called Kerkent, which is a Berber word that means “rocky hill”. During the Norman time, Saint Gerlando, who was from France and a relative of Count Roger, became the Bishop of Gergent, which was the name of the town at that time. He converted the local Muslims and the Orthodox to Catholicism and founded the present cathedral on the very top of Girgenti Hill. The Chiramonte family, originally from France, settled in Gergent and at the end of the 13th century built its own castle next to the cathedral. They financed several different religious buildings some of which can still be seen today. The most famous one is the Monastery of Santo Spirito. In the following centuries the town was under the control of the Bishops and it lacked of social and economic development. In the 18th century the town started to be visited by foreign travellers who mainly reached it by boat and who appreciated the Valley both for the archaeological remains and for the beauty of its landscape. This is the reason why today the landscape of the Valley is also protected. It’s the oldest church of Agrigento dating from the XI century. It was used as Cathedral till the XI century. Originally it was an ortodox church. It’s built on a Greek temple from the Vthe century B.C. which looked more or less like the temple of Concord. Tourist excursions and visits to Agrigento with a licensed Guide. Book online your visit!